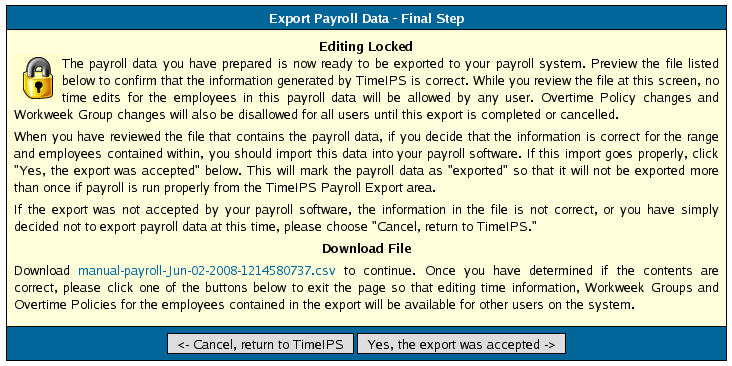 TimeIPS Payroll Export can generate a file with your payroll data. Many of these files can be opened in a spreadsheet application, such as Microsoft Excel or OpenOffice Calc, or, if using the Payroll Integration with Benefits Tracking optional module, the file can be imported in your payroll application, such as ADP, Paychex, or QuickBooks. NOTE: If necessary, it is possible to manually select your payroll time range and employees as well as change the export settings for payroll using the appropriately labeled tabs at the top of this page.. There are many export formats available, in the above example Manual (.csv) has been chosen. The manual payroll export offers a basic comma separated values file that can be opened in a s spreadsheet program such as Open Office Calc or Microsoft Excel. On the next screen be sure that your new preset is the one selected in the Export Settings Preset drop down menu. Optionally if you wish to add a comment to the export making it unique and easily identifiable you can do so now. Note: Editing of time events is locked during payroll processing to avoid having another user make changes via the Time/Edit Report that would not be reflected properly in the current payroll run. 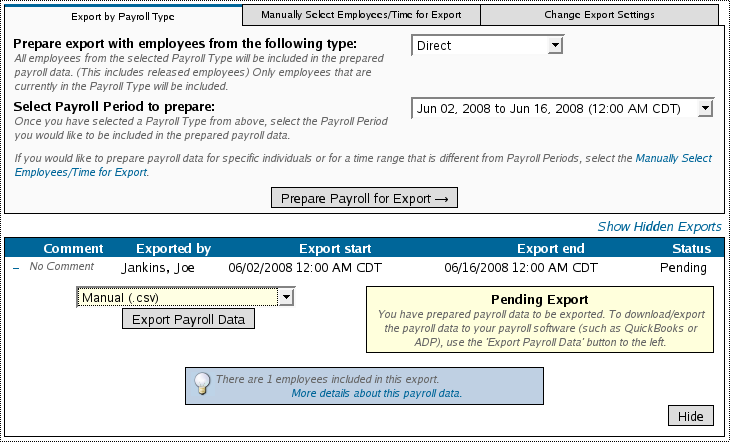 Click on the download link to save the newly created payroll export file. If you chose Yes, the export was accepted you should now see the payroll run labeled as Exported Exported payroll runs are locked, time can no longer be edited in the system for this period of time. The TimeIPS Knowledge Base is updated frequently. Please continue to check back for further details about TimeIPS payroll exports. call our Customer Support staff at 877-846-3256.